Cold weather, a hectic work schedule or even boredom with your workout routine can throw you off your fitness and nutrition goals. Don't cave into your excuses. Instead, stick to your goals with this 30-day fitness challenge. The best part; you don't need to be super-fit or belong to a gym to commit to this challenge. The 30-Day Fitness Challenge is designed to work every major muscle group in your body—every day. 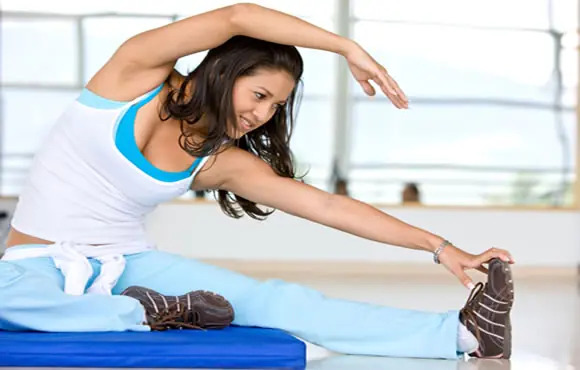 The structure of this fitness plan gives you the opportunity to improve your fitness and reshape your body while allowing each muscle group adequate recovery time. So how does the 30-Day Fitness Challenge work? Each day you have a different mini-challenge. This beats boredom and works your muscles efficiently because your body won't expect the different exercises. Whether you're new or skilled at working out, each mini-challenge is tiered to challenge any fitness level. The goal is to get you stronger, fitter, and healthier in a month—without getting bored. 1. Review each of the following slides for details on what to do each day. Be sure to review all the photos so you're familiar with proper form and range of motion to prevent injury. 2. Pick a start date and write it on your calendar. 3. Enlist support. Forward this challenge to a friend. It's more fun to work out with a buddy. 4. Download your tracker to stay on top of your progress. 5. Get social for more support and motivation. ‘Like’ the 30-Day Challenge Series on FaceBook and follow @30_Challenge on Twitter. The tracker allows you to record your time, number of reps, levels, and whatever the day's mini-challenge is asking you to track. After 30 days, you'll have a clear data-based view of how much strength and stamina you've gained. Sculpt your abs, build lean arms, and tone your shoulders with the push-up challenge. Your goal is to do 100 push-ups. The ab challenge will help you sculpt and strengthen your midsection in no time. From crunches to hip extensions, the following exercises will help you strengthen your core and flatten your belly. Whether you're looking for tighter glutes, leaner legs or firmer thighs, the lunge challenge is your gateway to a stronger lower body. Check out these exercises that you can do anywhere. Repeat your favorite challenge. If you need a day to rest, take it today. Or, if you're up to a huge test, do all the mini-challenges for time. Break out of your normal cardio routine. Run, walk, crawl, bike, skate, or ski—just move a mile. The core is a complex series of muscles that includes your entire body, minus your legs, head and arms. Various plank exercises challenge all the major muscle groups and stabilizers, improve strength, and prevent injury. Try these plank options. Repeat your favorite challenge or rest if you need to. Take it up a notch and do all challenges for time.